Print a page or part if an email message. 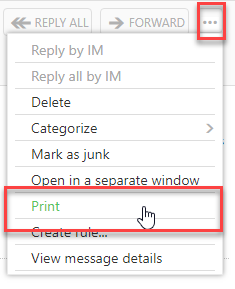 You can simply print an email by selecting File > Print. If you only want to print a single page or subset of pages, you can do that using the Print Options dialog box. 1. Double-click on the message you want to print. 2. Select File > Print > Print Options. 3. Select the printing options you need. 4. Under Page Range section, enter the number of pages you want to print. 2. 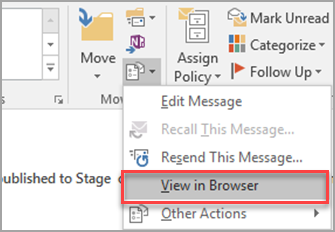 In the open message, on the message tab, in the Move group, click Actions>Other Actions, and then click View in Browser. When you see a security message, click OK to continue. 3. In the message, choose the section that you want to print. Select the text or other part of the message directly in the browser window, not in the Print Preview window. 4. On the browser toolbar, click the arrow next to the Print button, and then click Print. 5. Under Page Range, click Selection, and then click Print. 1. Select the message you want to print. 2. From the three dotted menu, select print.